I made up the foccacia dough this week because I wanted to make the fougasse shape (they look so pretty!). I put rosemary and salt on the top. 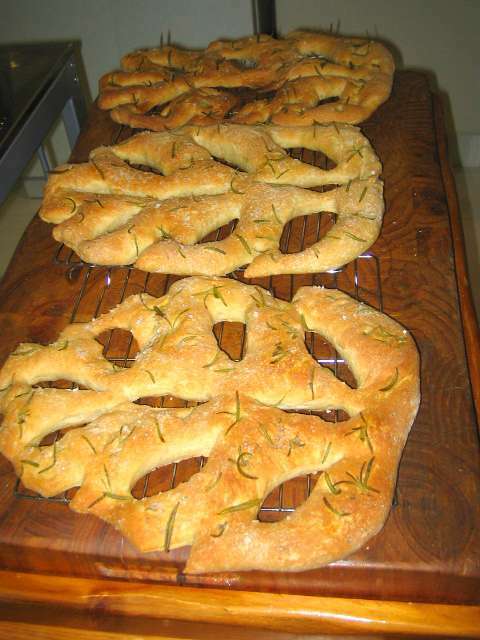 I agree on the fougasse, easy and nice presentation. Great to pull apart at a dinner party. My friend just sent me a GIANT box of dates from Oman and, after gorging myself on them for the past few days, I made date paste out of some of it. The sticky bun idea is great, and I'm thinking of all the other things I can do with the stuff. Those fougasse breads look great. I've never made that shape from BWJ (although I have made the foccacia dough), but I use Nancy Silverton's fougasse recipe a lot. It's a very impressive shape to bring to a party or present to guests. Today I made the BWJ pita breads. These were actually somewhat similar to the matzohs, in that you roll them out and throw them in the oven, leaving them to bake for just a few minutes. Because they contain yeast (unlike the matzohs), they puff up in the middle. I never really thought about it before today, but pita is really a bread that's all crust, no crumb. And you remove it from the oven before the crust hardens, so it remains soft. These breads came out great, they were fun to make, and they were a big hit at the Kentucky Derby party I attended today. The recipe uses a sponge (unlike most commercial pita breads, I suspect), giving the bread a flavor boost and also improving its keeping qualities. Unlike packaged pitas, you could leave these breads out in a basket on a table all afternoon and they didn't get stale. I was a little concerned about the fact that almost half the flour in the recipe is whole wheat, but that too adds to the flavor of the final bread. They didn't taste like "whole wheat" pitas-- they just tasted really good. I have been greatly inspired by this thread and would love to see it reactivated. 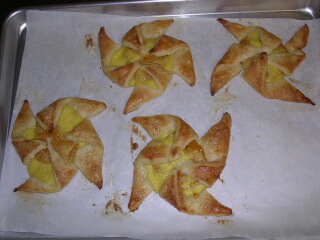 In that spirit, here are my attempts at pinwheel Danish (apricot filling) and sesame bagels. I found the Danish dough to be very forgiving and easier to work with than I expected. The apricot filling was much too sweet for me -- next time I would start with 1/2 the sugar and test/taste until satisfied. 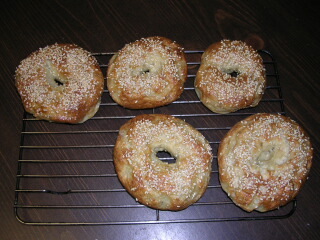 The bagels were great fun -- the instructions in the book are terrific and really guide you through. Very chewy and satisfying bagels. Hard to get them uniform, though! Welcome Ruth -- your pinwheels and bagels look really good. I wouldn't worry about getting the bagels even. I think the artisanal look is part of their appeal. Ruth, excellent efforts! I might be up to do something from this book again. What were you thinking of doing next? My goodness! Thanks so much for your kind comments. I must say, having read your participation in this thread was a great part of its appeal! Thanks, Arbuclo! I'm eager to try the croissants (which I've never done before). You game? Ruth, be careful with the croissants. Several of us here have had less than stellar results with the croissants - perhaps Dorie could be of some assistance here. When I tried them (admittedly the first time I'd tried making croissants, though not my first laminated dough), I really struggled to get the dough to the dimensions specified in the recipe (and I had the episode on my Tivo, too, and would go back and forth between the living room and my kitchen). When I proofed the croissants that I did get (nowhere near the yield stated in the recipe, due in large part, I'm sure, to my struggles during the lamination process), they seriously leaked butter, which could mean that I proofed them too warm, but I was very disappointed at the end result, considering how much work I'd put into the croissants to begin with. I'm not trying to discourage you from trying the croissants in the book, just alerting you that it's a tricky recipe that requires plenty of time and patience. Knowing more now than I did then, I'd advise you to put the dough back in the fridge if it starts resisting you when you are rolling it out. Thanks for that advice. I will strive to work slowly and patiently. We're having fairly cool weather this week which should work in my favor. I had the exact same problem with butter leakage the one time I tried the BWJ croissants, and I resolved that if I ever try them again, I will just proof at room temperature and not in the warmed oven. I was able to get the dimensions specified, although it was a laborious process that I interrupted over and over again as I put the dough back in the fridge when I felt it was getting to warm or needed it to relax. Being new to eGullet, I hadn't seen this thread until today. I got my copy of BWJ in 1997 or 98. I have made the Rustic Potato loaves many times. My husband loved them and said they were like the bread that his grandmother had made. Also made Pain de Campagne many times. I made the Swedish Limpa but wasn't satisfied with it. Just doesn't come up to the one that our "Swedish Chef" made at a local smorgasbord. Now I'm inspired to try the Brioche. A local French trained baker that owns a B&B was selling beautiful Brioche and petite pains au chocolate at our Farmer's Market last year, made with ingredients he was importing from France. Unfortunately, he isn't there this year. I'm afraid it wasn't cost effective in a such small rural community. They were heavenly! I've enjoyed reading through this thread even though I haven't had time to read everyone's adventures yet. Keep up the good work, all. Alas, I don't think I'll attempt the croissants. I'm in Dubai and it's 41C at 10am + humidity. If this recipe is finicky then I'd definitely have problems. What's on your agenda after them, Ruth? Oh dear -- croissants sure don't sound like a good option for you!! I haven't thought ahead yet to what I'd like to try next -- is there anything on your list you're hankering to do? I would like to try to make croissants again. I tried once many years ago, not from BWJ, but from Gourmet or Bon Appetite, as I recall and it was a disaster so I never tried again. There just aren't any decent ones available in this area. The places that have them use frozen dough that is shipped in and baked. Apparently butter is unheard of by the manufacturers. Super -- I've already got the dough resting in the fridge and am adding the butter block tonight. Probably won't actually bake them off until Friday or Saturday. I'll try to remember to take pics! Quick question for those who have done croissants before -- is there any reason I couldn't shape the croissants, allow them their final proof, and then freeze them prior to baking? Ruth, I'm really interested to see how your croissants go. I haven't made them but I don't see why you couldn't freeze them and bake them later. Are you going to give it a try? I've spent the last hour looking through the book for some suggestions on what I'd like to do next. I don't have any guests coming to dinner soon and am in fact going to be on vacation for a couple of weeks in a few days. So I need something that's immediately consumable by 2 people or could be frozen! I'm definitely going to do the potato loaves. But for things I haven't done: matzos have intrigued me since Seth first talked about them waay up thread. Gingerbread baby cakes sound interesting. Perhaps Lemon Loaf Cake, Crispy Cocoa Cookies, Mocha Choc Chips, Tourte Milanese (I'd use store bought puff pastry I think, or possibly just make the puff pastry and freeze it until I'm back from vacation), Alsatian Onion Tart. Interested in any of those? Have other suggestions? In the absence of expert advice, I will probably freeze 1/2 of the croissants prior to baking and bake the other 1/2 right away. I'll report back on the success (or lack thereof) of the venture! I did the second fold last night; third fold tonight and shaping in the morning. I will be away for the rest of the weekend (during which time croissants will be consumed) so I won't be able to post pix and results until Sunday evening at the earliest. Did you try the Brioche? Bought a pan at Wms Sonoma and will endure the 99 degree kitchen heat in Chicago to give it a go with you. I don't have the right pans, but I could probably jump on a brioche wagon in a week or so......... (lots of compulsory baking projects on the schedule for this coming week). After I posted, I read the recipe and it seems....scanned the recipe would be more accurate.....that a bread pan about 8 x 4 will do. I have never tasted Brioche, so it would be good to have a partner or two in the adventure.